At just 10 years old, her powerhouse voice skyrocketed to fame. Eight years later, she shares how she has dealt with an eating disorder with the help of her family. Reporter: The girl with the voice of an angel. ?????? discovered on "America's got talent" at just 10 years old. Now Jackie Evancho has transformed from that tiny performer to an 18-year-old woman. ?????? revealing for the first time the struggle she's faced growing up in the public eye. I always diagnosed with anorexia. I've been dealing with it since I was 15. I was only diagnosed when I was 17. When did you start having those struggles? With your weight? I think that when I started to really develop, like a woman's body instead. When I was 15. I just started high school again, public school. And I was just really self-conscious with my stomach and my face. And I would imagine being in the spotlight, like you said, seeing photos of yourself kind of amplified a lot of those issues, right? Yes, and I see all these other celebriies and I want to look like them, not myself. Reporter: Her parents noticed her skipping meals and intervened to get her help. Luckily I have a support system who loves me. Having an eating disorder is like having another you inside your head screaming all the worst things that you could hear about yourself. You're ugly, you're fat, you're stupid, you're worthless, all that stuff. And it's just every time you look in the mirror, you see something that's not there. With my eating disorder, I have body dysmorphia as well. So I won't be able to see what my reflection actually is. Because whatever it is in my head is distorting it. How do you deal with it now? I guess I'm a little more vocal about the thoughts that I have. When I have them. If I'm struggling, I'll tell my parents I'm having a hard time, what do I do? You're very open and honest with those around you? Yes. And that's key to avoiding, stopping, and recovering from an eating disorder. Reporter: Jackie considers herself a private person, despite so much of her life being out in the open. Including on the "Growing up Evancho." Standing on stage, it's definitely an escape. ?????? Reporter: Which featured Jackie's transgender sister, Juliette. My body didn't match my brain. Reporter: "Nightline" has followed the family over the years. ??? O say can you see by ??? Reporter: First on the eve of Jackie's performance at president trump's inauguration. She faced criticism for participating due to the trump administration's early record on gay rights. It got really mean. People were saying that I was -- a word I can't say live. Because I chose president trump over family, supposedly, because of the whole lgbtq controversy. Seeing my sister go through all of the hate mail, it broke my heart. Because the way Jackie looked at it, it was nothing political. Reporter: Jackie says she may have lost fans as a result. Everything that I do, I take seriously. And there are reasons that I have that they're not always going to understand. And I will never turn my back on my family no matter what. They're number one for me. I would give up my career in a heartbeat for them. Reporter: But Jackie says fighting unwanted political battles is not the only hazard of her celebrity. There was a lot of issues with pedophiles following me everywhere. I've had so many crazy experiences. I've had people pretend to be priests or say they're priests, then they get backstage. There was an instance where a priest asked me to sit on his lap while backstage. And I'm so glad I was smart enough to say, I'm not comfortable with that. Was he dressed like a priest? Uh-huh, he had the collar on and everything. Were you ever harmed in any way? I was never harmed physically. But mentally, I developed a lot of fears. There was just a lot of things that kind of changed who I was. Reporter: She says her family has stepped in to help keep her safe. My parents tried really hard to -- when I'm doing meet and greets, to make sure there were security guards there and that they would keep people at a distance. ?????? Reporter: The vocalist saying she feels more empowered now and is taking control of her career. People could tell me their ideas and I can reject them instead of me telling them ideas and them getting rejected. ??? He could be ??? Reporter: Putting her personal touch on a new album filled with current Broadway hits. ??? But I'm not that girl ??? This album is the most authentically me album to date. Reporter: And speaking out about her personal challenges is part of her healing. I really wanted to be that perfect role model. And as time goes on and all these issues are coming to front in the world, I'm starting to realize that being a perfect role model is also showing that you're not perfect. ??? Something beautiful ??? because that shows people that they can be just like you. Even if you're not perfect. ?????? Our thanks to Paula. 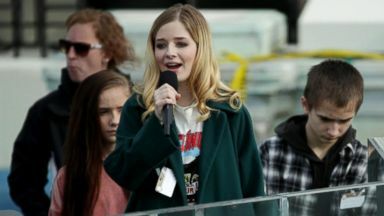 Opera prodigy Jackie Evancho volunteered to perform at Trump's inauguration as Juliet Evancho undergoes her own life-changing event. The singer, now 18, says she suffered eating disorders and more, but has "no regrets" and hopes to be a role model for other young girls. Plus, ABC News' Ginger Zee swims alongside humpback whales and says it's "one of the most beautiful and majestic things I've probably ever seen." 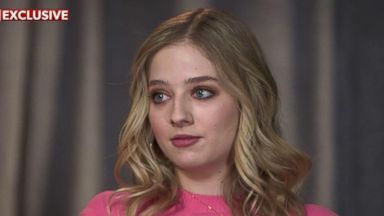 Jackie Evancho, 16, and her transgender sister Juliet Evancho, 18, tell "GMA" the message they hope to give Donald Trump after his administration's rolled back protections for transgender students.